Trim and shred radishes. A box grater will work, but your job will be easier with the grater blade of a food processor. Prepare the dressing by combining all ingredients except oil. Whisk in oil to create a creamy dressing. Stir in the lemon zest, turmeric and garlic. Toss radish shreds and scallions with dressing. Just before serving, sprinkle with sea salt. 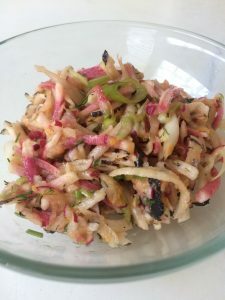 This slaw is very versatile and is a nice side dish on its own. Try it over rice with eggs for breakfast. Use a little to top fish tacos. Add a scoop to your favorite leafy green salad. The slaw will store for a week in the refrigerator.